Mother’s Day is next month, but today we celebrate the very most important mother of all. 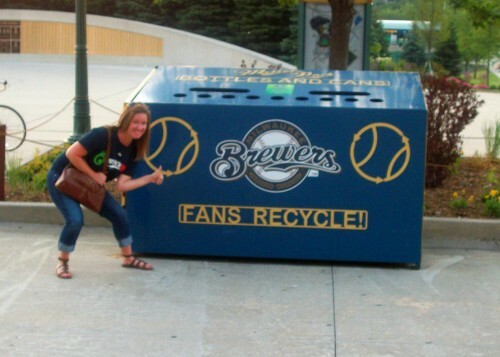 RECYCLE– I am the Recycling Queen. Ask anyone. It’s kind of an obsession. REUSE– I almost always buy recycled water bottles to begin with, but when I do, I reuse them for at least a few days. I know those reusable bottles are cool and all, but I have issues with them. Especially those with straws. How do you ever truly get those straws clean?! TURN OFF THE WATER– When I’m brushing my teeth. When I’m shaving my legs. When I’m washing dishes. I always turn off the water. We also recently purchased a high efficiency washer with sensors to ensure that no excess water is used. And while I absolutely hate the washer (HATE IT!!! ), I appreciate it’s efforts to save the planet. Good job, crappy washer, keep it up. DIY– When the weather warms up, we grow our own vegetables. When we have the time, we cook at home. Less packaging/garbage + healthier food is a win win! LIGHTS– At least 75% of the lightbulbs in our home are compact florescent. I am also obsessive about turning off lights we aren’t using. PAYING ONLINE– Sure, we still pay some bills by check but we pay the majority online, and even get the majority of our statements online. Less paper for the win! STRAWS– I use waaaaay too many plastic straws at work. CONVENIENCE PACKAGING– I eat yogurt almost daily. And due to ease (and the deliciousness that is Chobani Flip), I eat yogurt from individual containers almost daily. Of course I always rinse and recycle them. BAGS– I have reusable grocery bags. I just forget to take them with me. Like, every time I go to the store. I want Mother Earth to be around for a really long time. And I want her to stay beautiful for as long possible so I’ll continue to work on my earth friendliness. You do the same, okay? To celebrate the day I also wanted to eat something healthy. Something earthy, if you will. I kind of forgot about kale for a bit but today I remembered and boyyyyy am I glad I did. 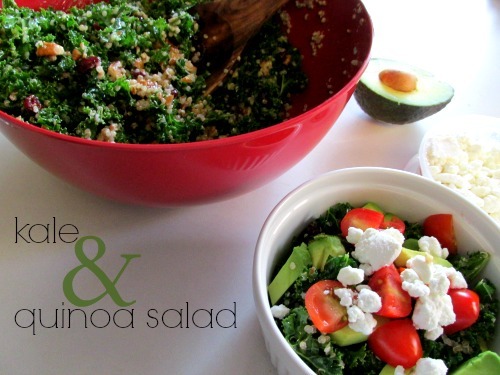 Inspired by this recipe, Kale and Quinoa Salad is totally customizable to your tastes and the “base salad” is even great on it’s own. 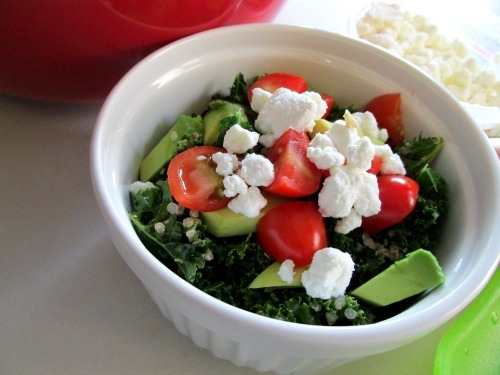 Massage kale in large bowl for 3-5 minutes until broken down. Add some sea salt and olive oil while massaging, if you please. I do please, as this makes the massaging process a little easier. Add quinoa, pecans, cranberries/cherries, and all other desired ingredients. Toss to combine. Whisk together all ingredients and pour over prepared salad. Toss to combine. My reason for creating a “base salad” with optional add-ins is twofold. 1. I have a picky husband eater in my house. 2. I knew I would have leftovers for lunch tomorrow and didn’t want any of it to go bad/get brown or mushy. The base should all be sturdy enough to hold up for a day or so. That said, I added all of the add-ins to my portion of the salad and it was divine! I was skeptical about the goat cheese because I thought I wasn’t much of a fan, but today I just went for it and discovered I LOVE GOAT CHEESE! It’s going on every salad I eat from here forward. ALL. THE. GOAT. CHEESE. i need to write that dressing recipe down asap, it sounds amazing!